Moments after clinching the title, Shotaro Ban saw his mom and the two happily exchanged hugs. After a long and emotional week, the 21-year-old was finally a champion. Ban, a senior at Cal, defeated 17-year-old Roseville resident Joshua Sedeno, 5 and 4, on a breezy Saturday at Lake Merced Golf Club to win the 104th California Amateur Championship. With the victory, he’ll join the likes of Johnny Miller, Mark O’Meara and Ken Venturi as players who have their names etched on the prestigious Edward B. Tufts Trophy. Shotaro Ban is the first Cal player to win the championship. Ban’s victory also marked the first for a Bear in the championship. Charlie Wi won the title in 1990, but that was before he transferred to Cal from University Nevada-Reno. Bears who never even reached the final include Max Homa, James Hahn and 2012 U.S. Amateur runner-up Michael Weaver. Having taken a 3-up lead in the morning portion of the 36-hole finale, Ban slipped early in the afternoon round when he missed a 4-foot par putt on the 2nd hole to drop his lead to 2-up. Through the next five holes, the No.26 seeded Sedeno, who was looking to become one of the event’s youngest winners (Mac Hunter won at age 16 in 1972), had chances to further cut into Ban’s lead but continually was denied. On the 22nd hole (No.4), the Del Oro High senior missed a 4-foot putt for a win, while on No.23 his par putt stopped an inch short of the cup, giving Ban a win. A hole later on No.24, Sedeno, who’s already committed to Southern Methodist University in 2016, three-putted for a halve. On the 25th, he was stuck with an awful lie in the rough off the left side of the green. Hitting nearly from his knees, his third shot skipped through the green for bogey, giving Ban a 4-up lead. From there, Ban kept the 4-up lead until he lost the 28th hole (No.10) after yet again pushing his drive to the right near the fence of the driving range. Two holes later though, Sedeno was again snakebit after he couldn’t get up-and-down from a bunker to save par. On the 31st hole (No.13), Ban made it up 5-up by sinking a clutch 7-footer for birdie. The two would halve the next hole with birdies. In the morning round, Ban took a 3-up lead, even winning a hole without having to step on the green. While still in high school, Josh Sedeno showed that he can play with some of college golf’s big boys. On the par-5 18th, Sedeno pushed his approach shot right behind a cluster of bushes. With no shot at the green possible, Sedeno looked to simply get back into play somewhere near the putting surface. His shot ended up in one of the cypress trees that guard the green and never came down. With Ban sitting two just off the front of the green, Sedeno opted to concede the hole, giving Ban a 3-up lead at the break. “I had a tough lie and I played aggressive and it didn’t work out,” Sedeno said. Earlier, Ban had jumped out to a quick 1-up lead with a birdie on No.1 and upped his lead to 2-up with a win on the 5th. He’d up his lead to 3-up when he sank a 21-foot putt for birdie on the par-3 12th, but Sedeno temporarily cut the deficit back to 1-up with wins on holes No.14 and No.15. Ban rebuilt his cushion to 3-up with his win on the 18th and a win on the 17th, where Sedeno missed a 4-footer for par. Despite the loss, Sedeno showed all week that he can compete with the big boys. In earlier rounds, he’d knock out St. Mary’s No.1 Jonathan De Los Reys and UCLA senior Jake Knapp, who was coming off an appearance in last week’s U.S. Open. Ban also had to grind. In earlier rounds, he defeated Bears teammates Ben Doyle and Keelan Kilpatrick. In both Friday’s quarterfinals and semifinals, he’d hold on for a pair of 1-up wins. For Ban, there won’t be much time to celebrate. Early Sunday morning he heads to Washington to start playing in the Sahalee Amateur Championship. It’ll be his third appearance in that championship in the last three years. “I’ve got to get my game in tip-top shape,” he said. Cal-Berkeley senior Shotaro Ban and Del Oro High senior Joshua Sedeno now have the biggest amateur golf prize in the Golden State in their sights. Ban, of San Jose, and Sedeno, who hails from Roseville, earned spots in Saturday’s 36-hole California Amateur Championship finale, winning their semifinal matches on a chilly Friday at Lake Merced Golf Club. Ban advanced with a 1-up victory over Stanford sophomore Franklin Huang, while Sedeno knocked off Ramie Sprinkling of Camarillo, 2 and 1. Part of that had to do with Huang. During the morning quarterfinals, Ban was playing behind Huang and San Jose State senior Cody Blick. Huang would put on a fireworks show from holes No.6 through No.11, going 6-under through the stretch with an eagle en route to knocking out the No.13 seeded Blick, 5 and 4. Cal senior Shotaro Ban had to work, earning two 1-up wins to reach the final. Ban also was still getting used to a new driver that he was using for the first day, having replaced the one he used earlier in the week after it bent. In the quarterfinals, it worked just well enough for him to slip past Pete Fernandez Jr, 1-up. In what became a see-saw affair, Ban trailed Huang by one three times over the first 12 holes. He wouldn’t take his first lead until he made a birdie on the 14th. Even then, Huang made it tough, as he’d just miss his own birdie try from 3 feet. From there, the two halved holes No.15 through No.17, going par-birdie-birdie. On the 18th, Huang still made Ban sweat, somehow getting up and down for birdie despite his second shot landing almost directly in back of the cypress tree guarding the left side of the green. Ban, however, again answered the call, also making birdie after reaching the par-5 green in two. In reaching the final, Ban had to defeat Bears teammates Ben Doyle and Keelan Kilpatrick. At age 21, it’ll be Ban who’s the veteran in the final. Sedeno though, who’s 17, has quickly matured during the week. The No.26 seeded Sedeno, a standout on the Junior Tour of Northern California, began his day by taking out No.2 seed Jake Knapp, 2 and 1. Knapp, a senior at UCLA, was coming off an appearance in last week’s U.S. Open at Chambers Bay. Earlier in the week, Sedeno took down St Mary’s No.1 Jonathan De Los Reyes and Gaels standout Hunter Rappleye. 17-year-old Joshua Sedeno took down No.2 seed Jake Knapp on his way to reaching the final. A Youth on Course member at Morgan Creek GC, Sedeno had to dig deep yet again to get by Sprinkling. Sprinkling, a UC Davis alum who won his quarterfinals match over James Holley, 2 and 1, was the oldest player left in the brackets at age 29. As he did versus Knapp, Sedeno grabbed an early cushion, taking a 3-up lead through the first seven holes. Sprinkling continuously tried to chip away at the lead, but Sedeno kept responding. With a birdie on the 14th, Sedeno again took a 3-up lead. Sprinkling won the 16th to cut it to 2-up, but the two halved No.17, sending Sedeno to the final in his California Amateur Championship debut. While Ban is still getting used to his new driver, Sedeno is still feeling some aches and pains. On his drive down to host Lake Merced Golf Club last weekend, the car he was riding in would be rear-ended, resulting in not only a sore neck and back, but also limiting him to only six practice holes. For both now though, there’s just one big match left. “I’ll be ready to go,” Sedeno said. Saturday’s 36-hole final begins at 7:30 a.m, with the afternoon portion starting at noon. Roseville resident Joshua Sedeno didn’t exactly get the start he wanted to heading into this week’s 104th California Amateur Championship. On his drive down to host Lake Merced Golf Club, Sedeno’s car would be rear-ended, resulting in not only a sore neck and back, but also limiting him to only six practice holes. “It’s getting better every day,” Sedeno said. While he’s still achy, things are indeed looking up. The 17-year-old Del Oro High senior, who’s already committed to Southern Methodist University for 2016, was one of eight players locking up spots in Friday’s quarterfinals, thanks to a 3 and 1 win over St. Mary’s junior Hunter Rappleye. In Wednesday’s Round of 32, he’d knock out St. Mary’s senior Jonathan De Los Reyes. Roseville’s Joshua Sedeno is the youngest player left alive in the brackets at age 17. While he’s only played Lake Merced GC a few times, the No. 26 seeded Sedeno is no stranger to playing against some of the best collegiate players in Northern California. In Roseville, he occasionally gets in rounds with two-time Rolex All-American Cameron Champ of Texas A&M and 2014 Pacific Coast Amateur Championship winner Corey Pereira at Morgan Creek GC. 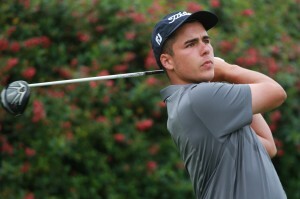 Sedeno also won this year’s Memorial Championship at Ancil Hoffman GC. Also advancing to the Elite Eight was San Jose State senior Cody Blick and Stanford sophomore Franklin Huang. Huang, the No. 28 seed, moved on with a 19th hole victory over Sahith Theegala while the No.13 Blick advanced with a 2 and 1 win over Cal sophomore KK Limbhasut. The two will face one another Friday morning at 7:40 a.m.
For Blick, it’s his second trip to the quarterfinals. He’d reach the quarterfinals at the 2013 championship at Monterey Peninsula CC before losing. Now more experienced, Blick is getting help this week from his younger brother Connor, who’s acting as his caddie. Connor is a sophomore who plays at St. Mary’s. San Jose State’s Cody Blick will next take on Stanford’s Franklin Huang. In his match against Limbhasut the two see-sawed through the first nine holes. Blick took a 1-up lead with a win on the 10th, but the two halved the next six holes. A scary moment for Blick came on the par-4 16th when Limbhasut nearly holed out from the fairway for birdie. Blick countered, however, by sinking a 10-foot birdie putt to salvage a halve. Blick closed the match out on the 17th when Limbhasut made double-bogey. In what was the second straight day featuring a clash of Bears, Cal senior Shotaro Ban outlasted teammate and fellow senior Keelan Kilpatrick, winning on the 19th hole. Down two holes through 16, Ban managed to bring the match back to all-square with a pair of par wins on holes No.17 and No.18. On the 19th hole (par-4 10th), Kilpatrick, who hails from New Zealand, pushed his drive right along the fence of the driving range while Ban’s drive found the center of the fairway. On his second shot, Kilpatrick could only advance his ball about 5 yards. Kilpatrick did reach the green after hitting a brilliant third shot along the ground, but he’d miss his putt for par, giving Ban the victory. A hole earlier on the 18th, Kilpatrick missed a 4-foot putt for par that would’ve given him a 1-up win. In Wednesday’s Round of 32, Ban knocked out Cal teammate Ben Doyle. Cal senior Shotaro Ban held on to defeat Bears teammate and fellow senior Keelan Kilpatrick. Four Bears made it to match play. All four ended up in the same bracket, with Ban now being the lone survivor. “It’s kind of crazy that between us four, we all ended up on the same side of the bracket,” Ban said. While there never was a chance of an all Cal final, there was the chance of a Ban-Ban final. That ended when Shotaro’s younger brother, Shintaro, lost to No.2 seed Jake Knapp of Costa Mesa, 3 and 2. Knapp, who played in last week’s U.S. Open at Chambers Bay, is the highest seed left in the brackets at No.2. He’ll next face Sedeno in the 7:50 a.m. quarterfinals match. Also falling in the Round of 16 was recent UC Davis grad Matthew Seramin of San Geronimo. 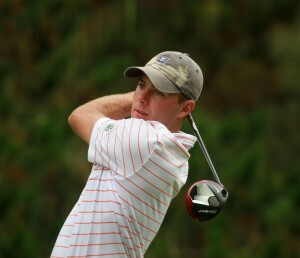 Seramin, who won last year’s NCGA Amateur Match Play Championship, fell 3 and 2 to No.11 James Holley of Chatsworth. Following Friday morning’s quarterfinals, the semifinals will be held, with the first group going off at 1 p.m. Saturday’s play will consist of the 36-hole championship match. At No.2, Knapp is the only top 10 seed still alive. The next lowest seeded player is Holley at No.11. At least for a day, the 104th California Amateur Championship turned out to be a Bears affair. Four players from nearby Cal-Berkeley reached Wednesday’s Round of 32 at Lake Merced Golf Club, but by the end of the day only three were left alive in the brackets. The only reason all four didn’t advance to Thursday’s Round of 16 was just a matter of the brackets. In what became a duel to the end, No.25 seeded Cal senior Shotaro Ban finally outlasted sophomore teammate and No. 8 seed Ben Doyle with a win on the 19th hole. On the 19th hole, Doyle blocked his drive right and could only punch out another 15 yards. He’d nearly chip in for par, but his ball stopped a few inches from the flagstick. Ban managed to save par, getting up and down from the greenside bunker. “On the front-nine, we talked quite a bit. After making the turn though it got pretty serious,” Ban said. In the Round of 16, Ban will get to do it all over again. He’ll take on fellow Cal senior and No.9 seed Keelan Kilpatrick, who advanced with a 1-up win over Ryan Han of UC Davis. Cal senior Keelan Kilpatrick, the eldest of the Bears still in the brackets, next faces teammate Shotaro Ban. A native of New Zealand, Kilpatrick took a 2-up lead over Han with a par on the 16th. Han cut the deficit to one hole with a win on No.17, but the two halved the 18th with pars. While most of the other Bears don’t have a lot of match play experience, Kilpatrick played in the format regularly in his homeland. “Match play is what we usually play in New Zealand, so I’m very comfortable with it,” said Kilpatrick, who had his girlfriend, Mckenna, on the bag as caddie. The Cal guys also have somewhat of a home course advantage this week. Lake Merced GC is one of their regular practice courses. While both seniors, Kilpatrick is the eldest Bear at age 23. Ban will turn 22 in August. 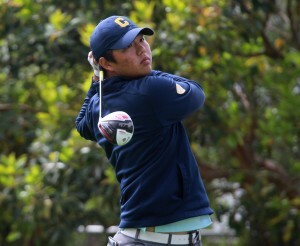 The other Cal player moving on was sophomore and No.4 seed KK Kimbhasut. Limbhasut moved on after dispatching USC freshman-to-be Justin Suh, 3 and 2. 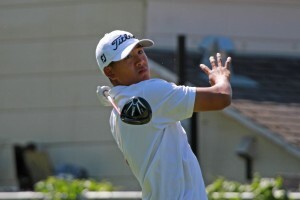 Suh, who won this year’s San Francisco City Championship and was the Junior Tour of Northern California Player of the Year in 2013, held a 2-up lead through 10 holes. Then his putter deserted him, while Kimbhasut got hot. After bringing the match back to all-square, Limbhasut took a 1-up lead after chipping in for eagle on the 14th. Limbhasut closed the match with a par on No.15 and another birdie on the 16th. 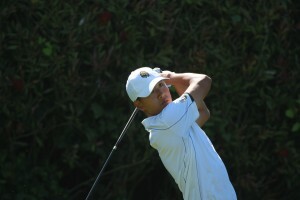 Cal sophomore KK Limbhasut advanced with a 3 and 2 win over USC freshman Justin Suh. Limbhasut knew that Suh wouldn’t be a pushover. As a senior at Redlands High, Limbhasut watched Suh win last year’s CIF Boys State Championship. In another Northern California showdown, Limbhasut will next face No.13 seed Cody Blick of Danville. Blick, a senior at San Jose State, advanced with a 3 and 2 victory over Palm Desert’s Nicholas Mullhaupt. Other Northern California players advancing through the brackets were No.15 seed Shintaro Ban, No. 26 Josh Sedeno, No.27 Matthew Seramin and No. 23 Hunter Rappleye. Ban, who won last year’s San Francisco City and now plays at UNLV, will next take on No.2 Jake Knapp, who missed the cut at last week’s U.S. Open at Chambers Bay. Sedeno, a Junior Tour of Northern California standout who’s headed to SMU in the fall of 2016, will face Rappleye, a junior at St. Mary’s. Seramin, who moved on with a 2 and 1 over Lorens Chan, is the No.27 seed. Last year, the recent UC Davis grad won the NCGA Amateur Match Play Championship as the No.26 seed. Medalist and No.1 seed Satch Hermann of Ventura advanced, winning his opener, 2 and 1. Dan Sullivan of Pasadena, who was the oldest player (age 49) in the field to make match play, fell 4 and 3 to Anaheim’s Puwit Anupansuebasi, who at 15 is the youngest player left in the brackets. Thursday’s Round of 16 begins at 7:30 a.m.
A day after shooting a 77, 2014 NCGA Amateur Match Play Championship winner Matthew Seramin knew he had to get busy. The recent UC Davis grad ended up doing just that in Tuesday’s second round of stroke play qualifying at this week’s 104th California Amateur Championship. 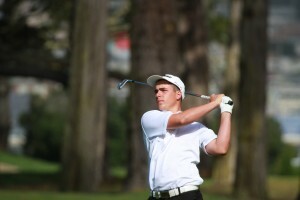 Seramin, 23, carded a solid 3-under 69 at par-72 Lake Merced Golf Club, pushing him to what was the magic number (2-over 146) to be one of the low 32 advancing to match play. In a rarity, the cut came on the number with no playoff necessary. Seramin was one of eight players coming in right at 146. 2014 NCGA Amateur Match Play champion Matthew Seramin made the cut on the number. In shooting his 77, Seramin only carded one birdie with six bogeys. Under the gun, he’d post four birdies with just one bogey. The medalist and No.1 seed will be Satch Hermann of Ventura, who came in at 8-under 136 after a stellar 66. While he competed in the recent U.S. Amateur Four-Ball across the way at the Olympic Club, Hermann is making his California Amateur debut. He’ll take on No.32 seed Eric Sugimoto of San Diego in Wednesday morning’s opening Round of 32 match. 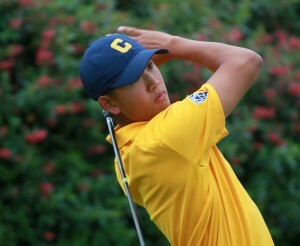 Also making a move with the pressure on was Cal senior Shotaro Ban. Ban penciled in a 70 a day after a 76 to also come in at 146. He’ll now has a chance to play his younger brother, Shintaro, in the final should they both advance that far. Split between the upper and lower brackets, Shotaro is seeded No.25, while Shintaro, who plays at UNLV, is the No. 15 seed. The highest Northern California seed is No.4 KK Limbhasut. A sophomore at Cal who hails from Loma Linda, Limbhasut shot 71 to finish among three players tied for second at 139. Medalist Satch Hermann of Ventura. 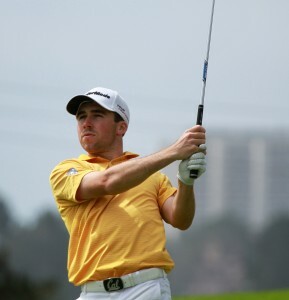 Cody Blick, a senior at San Jose State, earned the No.13 seed after coming in at 144 after a 75. He’ll open match play against No.20 Nicholas Mulihaupt of Palm Desert. Shintaro Ban will open versus recent CSU-Monterey Bay graduate Robby Salomon, who came in at 145 to grab the No.18 seed. On Tuesday, Salomon had former CSUMB star and 2014 NCGA Women’s Amateur Championship winner Audra Kepler on the bag as caddie. The oldest player to advance to match play was 48-year-old Dan Sullivan of Pasadena. The second oldest player advancing was 29-year-old Ramie Sprinkling. If anyone knows how wide open match play can be, it’s Seramin. He’d capture his 2014 NCGA title as the No.26 seed. The NCGA North team and captain John Ronca. “Anything can happen now,” Seramin said. In the North/South Challenge, the South came out on top by 24 strokes, 713-737, to earn the Roger Lapham Trophy. The last time Sacramento resident Jonathan De Los Reyes played competitively at Lake Merced Golf Club was at the NCGA Junior Championship when he was 13 years old. Almost a decade later, and despite the stakes being a bit higher now, De Los Reyes appeared right at home at the club in Monday’s first round of stroke play qualifying at this week’s California Amateur Championship. The St Mary’s senior was one of five players grabbing a share of the lead, posting a solid 4-under 68 in the wind and cold of Daly City. All five were part of the morning wave of tee times. Jonathan De Los Reyes of St. Mary’s is among the leaders at 68. Starting on the back-nine, the2014 Alameda Commuters champion began his day with a bogey on No.11. He’d quickly get to red figures with back-to-back birdies on holes No.13 and No.14, and later dipped deeper into red after posting a 33 on the front-nine that featured four birdies and a bogey. De Los Reyes has had the hot hand before. In winning last year’s Alameda Commuters, he’d tie the tournament record for low score (18-under 266), set by former NorCal amateur great and current PGA Tour member Matt Bettencourt in 2002. At Lake Merced, he’s on another course that fits his eyes. The four others opening with 68 were Jake Knapp of Costa Mesa, KK Limbhasut of Berkeley, Lorens Chan of Honolulu and former Penn golfer Max Marsico. Knapp, a senior at UCLA who missed the cut at last week’s U.S. Open at Chambers Bay, shot a 3-under 33 on the front-nine that included an eagle on the par-5 6th hole. “I was being tentative early then I made the eagle and got going,” Knapp said. 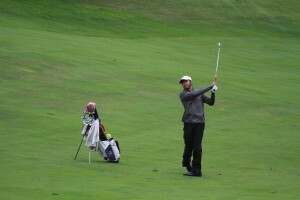 Limbhasut, a sophomore at Cal originally from Loma Linda, was the epitome of steady, posting 14 pars and four birdies. Three players, including San Jose State senior Cody Blick, are one behind after opening with matching 69’s. 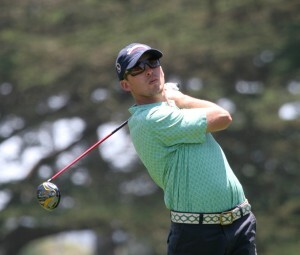 Blick was co-medalist in a U.S. Open local qualifier in May at Silverado Resort in Napa. A group of six players, including Cal’s Shotaro Ban and Fresno City Amateur runner-up Michael Tolladay are two back after shooting 70. San Francisco City champion Justin Suh, former S.F. 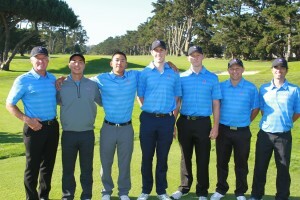 City champ Will Brueckner and Ryan Han of UC Davis were among a pack of nine players shooting 71. Playing Lake Merced for only the second time, Suh missed seven putts under 5 feet. In a role reversal, Brueckner had Cal senior and recent NCGA Women’s Amateur champion Carli Childs on his bag as caddie. Brueckner caddied for Childs in the NCGA Women’s Amateur. In the North/South Challenge, which takes the best five of six scores from each squad, the South squad leads, 357-368. Suh had the low score for the North while Knapp led the South. Tuesday’s second round of stroke play qualifying begins at 7 a.m. Following play, a cut will be made with the low 32 advancing. The last California Amateur Championship at Lake Merced Golf Club became a life-changer for winner Geoff Gonzalez. While Gonzalez was able to bask in the glory of it all, it didn’t come easy. In the 36-hole championship finale, he took on savvy veteran Jeff Wilson of Fairfield. Wilson was not only twice Gonzalez’ age, but also a five time USGA medalist, the most in Northern California history. In what Gonzalez called the “key moment,” of the final match, Wilson appeared to be in great shape on the 17th hole after a drive in the fairway, while Gonzalez looked to be in purgatory after knocking his tee shot into a cluster of trees. On their second shots, Wilson hit his approach to within eight feet of the flagstick, while Gonzalez was still stuck behind the green. But then it happened. In a huge momentum switch, Gonzalez proceeded to chip in from behind the green for birdie, while Wilson missed his putt. 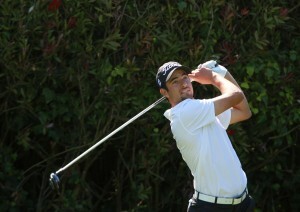 Geoff Gonzalez, who won the last California Amateur at Lake Merced GC, has since turned pro. Later in the afternoon, Gonzalez took the lead on the 27th hole and never looked back, eventually claiming a 3 and 2 win. With the victory, Gonzalez became the first player in 15 years, and just the 12th overall to win the championship and medalist honors. The win also would indeed turn out to be a stepping stone. Having since turned pro in the fall of 2011, Gonzalez has twice been a full-time member of the PGA Canada Tour (2012 and 2014) and has won multiple times on the eGolf Professional Tour, another developmental circuit that hosts events on the west and east coasts. The last four years, he’s also advanced to at least the Second Stage at Web.com Tour Qualifying School. As Gonzalez knows, getting onto the PGA Tour is a long, hard road. But he also feels he’s getting closer to realizing his dream. All thanks in part to his win at Lake Merced. 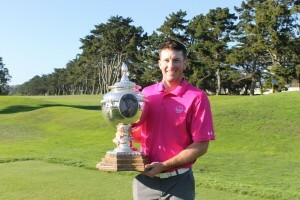 Beginning Monday, June 22 at Lake Merced Golf Club in Daly City, the chase to win the illustrious Edward B. Tufts Trophy will begin anew as the 104th California Amateur gets underway. Not surprisingly, the field is also loaded with talent. In just the North/South Challenge alone, which is held in conjunction with the championship and sees the winning team awarded with the Roger Lapham Trophy, there’ll be six of NorCal’s best amateurs taking on six of SoCal’s best players. The North six will be Luke Vivolo, Nick Moore, Justin Suh, Shotaro Ban, Jason Anthony and Trevor Clayton. The South six will be Sahith Theegala, Gordon Neale, Bobby Holden, Jacob Knapp, Pete Fernandez Jr. and a player to be named. Clayton is the defending NCGA Player of the Year, while Moore claimed his second NCGA Public Links Championship title earlier this year. Defending champion Xander Schauffele will not be in the field. Some of the other players in the field to keep an eye on include Cal sophomore Sebastian Crampton, St. Mary’s senior Jonathan De Los Reyes, Shintaro Ban and 2014 NCGA Amateur Match Play Championship winner Matthew Seramin. The field will also include five former winners of the event: Don Dubois (2005), Steve Woods (1994), Tim Hogarth (1999), Ed Cuff (1998) and Gary Vanier (1982). Schauffele, who defeated Hossler 2-up at La Costa Resort to win the 2014 title, is not playing. Former winners of the championship include Ken Venturi (1951, 1956), Johnny Miller (1968), Mark O’Meara (1979) and current PGA Tour member Spencer Levin (2004). Both Monday and Tuesday’s action will consist of stroke play qualifying, with the low 32 players then advancing to match play. Lake Merced GC annually hosts the LPGA Tour Swinging Skirts Classic and has hosted the 2009 NCAA West Regional Championship and 2012 U.S. Junior Girls’ Championship. Since the California State Amateur’s move to a north/south course rotation in 2007, six of the eight champions have won on what could be called their home course (Ie. 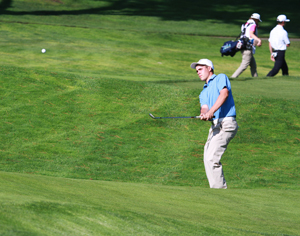 an NCGA player winning at a NorCal site).